John Sigwalt (1836-1924), born in Alsace, France, came with his family to the United States in 1852. 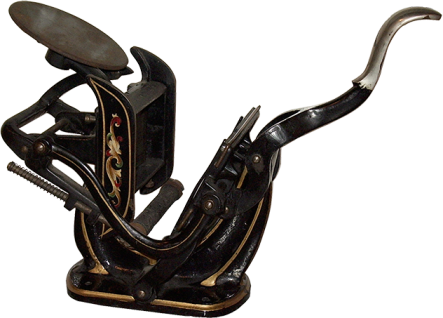 For a while he worked in the sewing machine business; in 1899 he began producing small printing presses that were copies of various models made by other manufacturers. His Chicago Press, a copy of J.F.W. Dorman’s Baltimore 11, was on the market by 1910, and Sigwalt based his Nonpareil 4×6 on William Golding’s 4×6 Official No. 2. As seen in the photo, this Chicago has most of its original detailing. A similar press, the Chicago No.11, was made with two rollers.